The iconic Parisian sneaker brand is now available in the Philippines! What do Filipinos and Parisians have in common? We both share the same fast-paced lifestyle and love for fashion and comfort, which is why we’re sure you’ll love the French sneaker brand Bensimon. 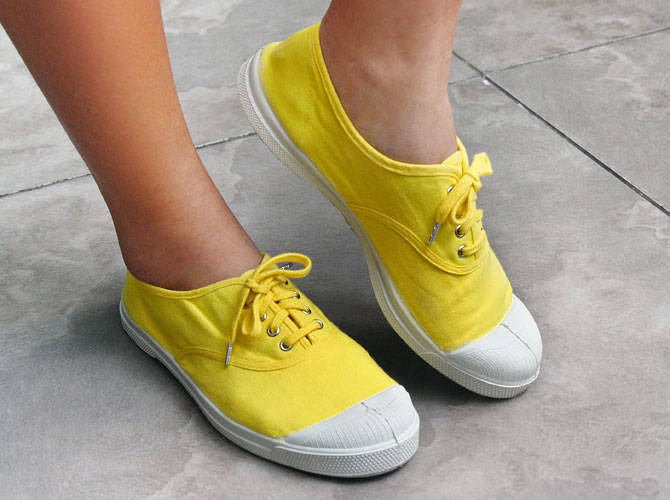 Bensimon’s classic sneaker design embodies the Parisians’ love of life—simple, effortless, and natural—characteristics that are also very much Filipino. The canvas shoes are not only comfortable for everyday use, but they also come in a variety of bright colors and styles that cater to your individuality. Case in point: The sunny yellow pair in the photo that we're officially wearing everywhere! Bensimon sneakers will be available in Center of Gravity (Forbes Town, Burgos Circle, and Centris Walk), Shoe Salon (Glorietta 3, Power Plant Mall Rockwell, Robinson’s Ermita, Shangri-La Plaza Mall, and Trinoma), and Shoe Thing (Kids styles only: Bonifacio High Street, Eastwood Mall, and Greenbelt 5). The price ranges from P2,095-P2,565 for the men's and women's line, and P1,295-P1,795 for the kids' styles.